DAWN-RAFH Canada was one of ten organizations which was recognized by Handicap International under its Making It Work (#MIW) initiative, a methodology for documenting and promoting good practices in line with the principles of the UN Convention on the Rights of Persons with Disabilities (#CRPD). Specifically, these ten organizations were selected for their models of global best practice in addressing Gender Based Violence (#GBV) against women and girls with disabilities. From June 4th to 7th, I had the honour to work and collaborate with the women from our sister organizations from around the world. 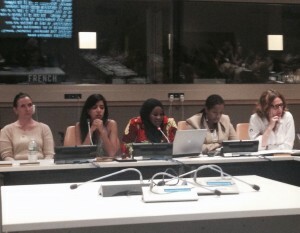 On June 8th we participated in a Global Gender and Disability Forum hosted by Handicap International as part of the Civil Society preparations for the 8th Conference of States Parties (#CoSP8) on the CRPD. Today as we are just over a week away from our 30th Anniversary as a feminist disability organization, I am pleased to share an excerpt from our Panel. “The good practices that are part of the Making It Work initiative have been developed in the absence of strong leadership at the international level, until TODAY. Given what we know about the size and enormous scope of the issue of Gender Based Violence, particularly Gender Based Violence in the context of intersections of disability, race and other factors, our discussions and exchanges today have one imperative – ACTION! DAWN-RAFH Canada will be celebrating 30 years in service in just a few weeks. Our history dates to the advent of human rights legislation and frameworks in my own country, Canada. Senior Policy Officials working on women’s issues and disability issues saw that no one was speaking for or representing women with disabilities despite the higher rates of violence and poverty they faced and took an important first step, an ACTION which brought together seventeen (17) women with disabilities who were leading in their communities and so began DAWN Canada. 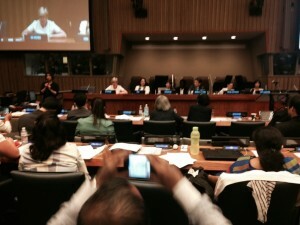 The Convention on the Rights of People with Disabilities and the CoSP8 have brought us together. But just as important are the Convention on the Rights of the Child, the Convention on the Elimination of Discrimination against Women, Beijing +20 and the Sustainable Development Goals; all of these are relevant when we are discussing violence against women. For those who wants to believe there are important differences between what`s going on in the developing and developed world, while this might be true for some, for people with disabilities, and particularly for women with disabilities, this simply is not so. We need more disaggregated data and while that is true, the quantitative and qualitative evidence from these ten (10) good practices alone give us a fulsome portrait of a global problem AND what a global response might look like. Handicap International’s Making it Work team uncovered over thirty (30) practices from every corner of the globe. These women, my global sisters and my own organization are proof that we can have a different response. This initiative has allowed us to share our expertise and to document our common vision and to share our way forward. Intersectional practice is the new buzz word these days in development. This opportunity has also rightfully positioned women with disabilities and Deaf women as the real experts on the intersectional approach and what that means and most importantly what it brings to the Violence Against Women discourse. The Forum for Arab Women’s Organizations of Negev, which is a mainstream women’s organization serving Bedouin women and girls with and without disabilities through the Ma’an Antiviolence Project brings forward the richness that comes from working in this way and speaks to the possibilities for all women to be free of violence. Ma’an`s record of appeals of denial of benefits for women with disabilities is impressive winning 4 out of 5 of their recent cases. One divorce case, filed on grounds of domestic abuse, concerned the loss of residency status for women who have entered Israel illegally. Ma`an won and now all women in Israel (often from Gaza) who gain residency status through their husbands will not lose their status when the separate or divorce due to abuse or violence. In 2012 the Supreme Court of Canada made an important decision which recognizes the right of all people with `mental disabilities` (the legal term) to be believed when they report assault and abuse. In the DAI decision a young woman with an intellectual disability reported assault by her stepfather. DAWN-RAFH Canada and the Women`s Legal Action Fund (LEAF) intervened. The Supreme Court agreed and a new trial was ordered. LEAF works with all types of women`s organizations in Canada – again reminding us that it is through an inclusive and intersectional approach we move the issue of addressing all types of violence against women forward. One of the key findings we also want to share is that all our good practices have common threads – which clearly highlights once again that the problem of gender based violence towards women with disabilities is driven by something more than our circumstances – women with disabilities are abused more often. Developing good practice to prevent violence against women with disabilities is, for many of us, part of the larger work we are doing to build the capacity and leadership of our women. 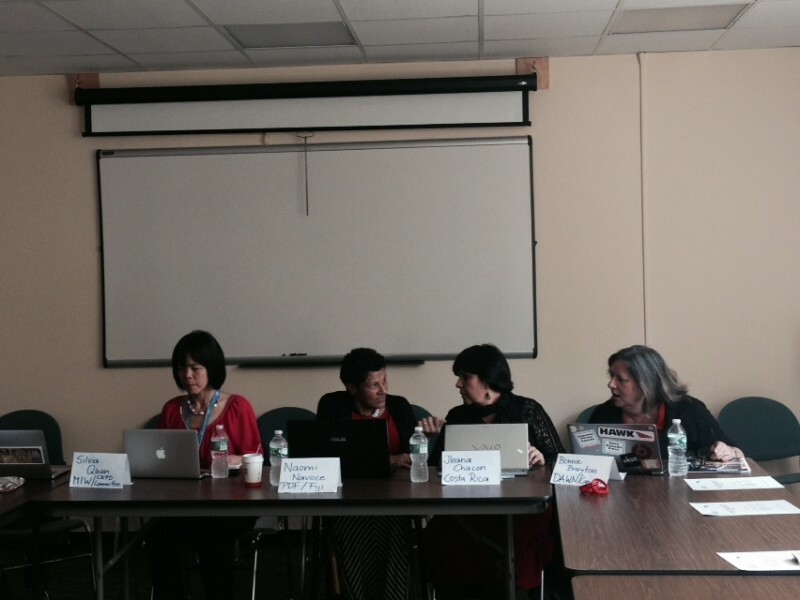 It is extremely important to make the linkages between these projects and our organizations. Now is the time to begin the deeper work of connecting all the factors that contribute to the over representation of women with differing abilities in a range of ‘post traumatic ‘ states, all of them manifestations of the physical, sexual, emotional and systemic abuse which ALL women experience. Disaggregated data; legal capacity; the application of legislation access to justice; and policy and funding reforms are key in any response. Together we can build on what we have done … In coming together with these women at the Gender and Disability Forum I am more hopeful than I have been for the half a billion women with disabilities and Deaf women against the thirty years our organization and its members have dedicated to working on this issue. Fatma Wangare Haji addresses the audience at the Gender and Disability Forum, part of Civil Society preparations for the 8th Conference of States Parties.